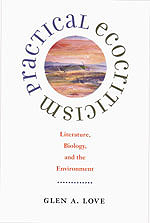 Practical Ecocriticismis the first book to ground environmental literature firmly in the life sciences, particularly evolutionary biology, and to attempt to bridge the ever-widening gulf between the "Two Cultures." Glen Love—himself one of the founders of ecocriticism—argues that literary studies have been diminished by a general lack of recognition for the vital role the biological foundation of human life plays in cultural imagination. Love presents with great clarity and directness an invaluable model for how to incorporate Darwinian ideas—the basis for all modern biology and ecology—into ecocritical thinking. Beginning with an overview of the field of literature and environment and its claim to our attention, and arguing for a biologically informed theoretical base for literary studies, Love then aims the lens of this critical perspective on the pastoral genre and works by canonical writers such as Willa Cather, Ernest Hemingway, and William Dean Howells. A markedly interdisciplinary and refreshingly accessible work, Practical Ecocriticism will interest and challenge the entire ecocritical community, as well as humanists, social scientists, and others concerned with the current rediscovery of human nature.